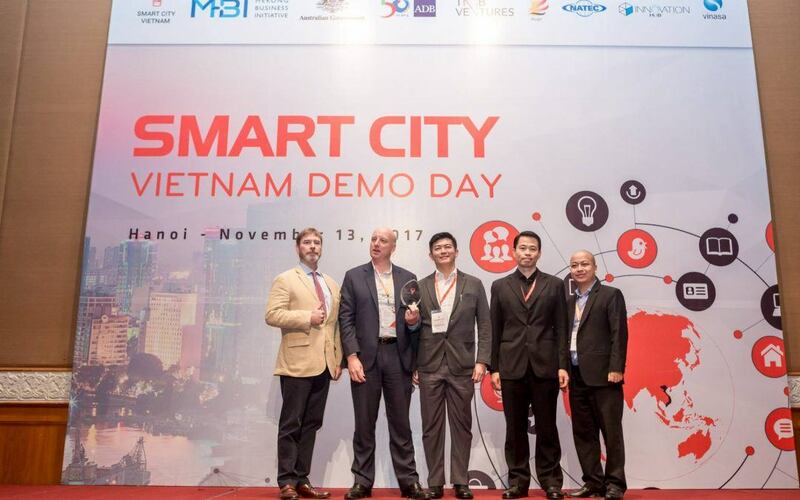 The Mekong Business Initiative organized a Demo Day to mark the end of the 5-month Smart City Innovation Challenge: a unique initiative to identify innovative enterprises from around the world with the potential to address real urban challenges facing Vietnamese cities. The Demo Day, hosted by MBI at Sheraton Hanoi Hotel, saw 15 outstanding finalists pitch and showcase their solutions to an audience of enterprise executives, investors, entrepreneurs, and key stakeholders within the smart city ecosystem and local government. Three top winners were selected at the Demo Day with cash prizes offered (1 st prize: USD5,000; 2 nd prize: USD3,000 and 3 rd prize: USD2,000) and will be fast-tracked to the cities’ programs to help accelerate the localization of their solutions. TNB Ventures, a venture capital partner for this Smart City Innovation Challenge Vietnam, is currently considering Series A funding for several high potential companies, subject to their internal due diligence. The Smart City Vietnam Demo Day Judging Panel commented that it was a tough decision to determine the 3 winners and thus decided to give an honourable mention to Whizpace, a TV white space technology company, for its great potential in enabling remote connectivity. Other finalists were also matched to noteworthy local mentors influential within the Vietnamese smart city and local business ecosystem. Through this mentor-mentee connection, the cohort will continue to grow and accelerate their sales pipelines, develop business planning, and receive valuable corporate insights regarding go-to-market strategy in Viet Nam. The Smart City Vietnam Demo Day was organized by MBI in cooperation with The National Agency for Technology Entrepreneurship and Commercialization Development (NATEC-MOST), HCMC Department of Science and Technology, Da Nang Business Incubator (DNES), Vietnam Angel Investor Network (iAngel) and Vietnam Software Association (VINASA).